Love Of Idaho is happy to present another story by the 6th grade literature class of Charter Academy. Falls Park is an old park with many historical parts. It is located in Post Falls, ID and helped develop nearby by areas like Spokane Valley and Post Falls. 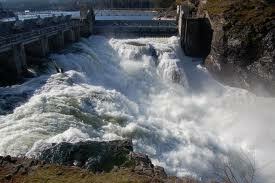 North Channel Dam is a historical dam and is still very useful. It gave electrical power to mines in Kellogg, Wallace, and Burke. It was sold to Washington Waterpower in 1901, and in 1902, they gave it the longest high-voltage transmission. Its first capacity was 11,240 kilowatts, but in 1980, it made an immense jump! It then was 18,000 kilowatts! It is a good example of early technology. The old construction tower had a large part in building the North cannel Dam. It was an anchor for a cable system and on the tower above it; a trolley transported much needed materials like form lumber. It also dumped concrete and helped lift head gates. When the dam was completed, it was too hard to take away so it was left behind. It had a big part in the construction of the North Channel Dam. Corbin Gates Ditch was a main element of Falls Park. It gave power for a nearby shingle-mill and the largest flour-mill. It controlled the water used for irrigation and is 34 miles long. Even though it’s just a ditch, it had a crucial part in developing the areas of Post Falls and Spokane Valley. The North Channel Dam, old construction tower, and Corbin Gates Ditch all played important parts in the foundation of areas surrounding Post Falls. I got all of my information from the signs at Falls Park.